KARMA is proudly owned and was handled to her Conformation Title by Caroline Williams. 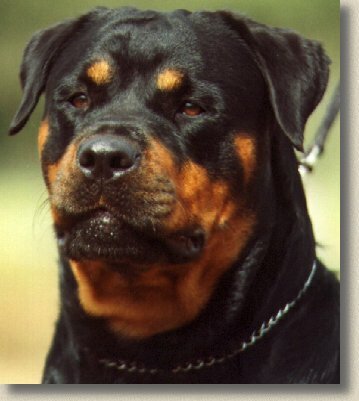 She was Caroline's first Rottweiler and they made quite a pair. KARMA was titled before her second birthday with many IN GROUP awards along the way. KARMA is a daughter of Aust.CH. KATHJEAN LADI KARA (Aunty) and inherited her great temperament and style. There was no one that she didn't like. An enthusiastic soul, she would greet everybody as though they had been away for years, even if you had seen her just five minutes before. Unfortunately a marriage split up meant that KARMA moved away and we no longer have contact with her.